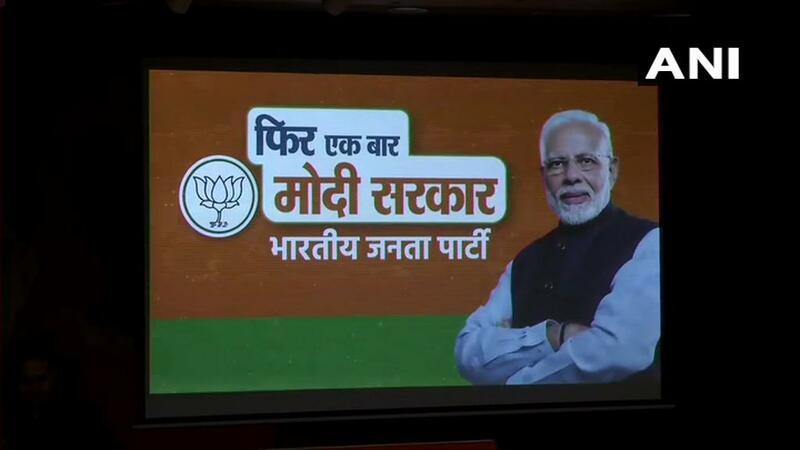 New Delhi [India] Apr 7 (ANI): Finance Minister Arun Jaitley on Sunday released the Bharatiya Janata Party's campaign tagline and theme song 'Phir Ek Baar Modi Sarkar Banate Hai, Phir Se Kamal Khilate Hai' (Let's elect the Modi government again and let the lotus blossom again) for the ensuing Lok Sabha elections. The ringtone "Chalo Ek Baar Phir Modi Sarkar Banate Hai" will also be available for Airtel, Jio, Vodafone, and Idea users. Jaitley, who called a press conference at the BJP headquarters to launch the party's campaign song and other media materials, said: "India wants a decisive leader who can promise hard working and corruption-free government. We want a government with one captain and not a team of 11 members with 40 captains." "Our campaign for commercial TV and radio will emphasise on national security, government's achievement, women empowerment through Ujwalla scheme, campaign against corruption, PM Kisan Yojana, the welfare of the poor, middle class and newly emerging middle class," he said. Jaitley took the opportunity to target Congress and said: "I am surprised that the Congress manifesto did not even have a word.. forget a sentence.. on India's emerging middle class. The poor people dream to become the middle class but the Congress has experts from abroad who think it is wise to raise taxation on the rich." "Congress has promised nothing new or unique. People believe in future promises when you have actually fulfilled promises made in the past. Their 1951 manifesto also talked about eradicating poverty," he said. Promising corruption-free and decisive government, Jaitley asserted: "The first theme of BJP campaign will be 'Kaam Karne Waali Sarkaar' (24x7 government)... Our second theme will be 'Imaandar Sarkaar' (honest government)...Our third theme will be 'Bade Faisle Lene Waali Sarkaar' (a government which takes big decisions)." The Union Minister further took a jibe at Robert Vadra for saying that he would campaign for the Congress in the elections. "I don't know if this will be an asset for the Congress party or for the campaign of the BJP," he said. While responding to Congress campaign song "Jan Jan Se Naata Hai Sarkar Chalana Hume Aata Hai", Jaitley asked, "Which government was associated with corruption and policy paralysis?" The Congress on Sunday launched its Lok Sabha 2019 campaign song and slogan that focuses on minimum income guarantee scheme (Nyuntam Aay Yojana).